Kicking off a new year is always exciting; a fresh start, new hopes, new aspirations, getting out the black-eyed peas, remembering to put the correct new year on dated documents and making New Year’s resolutions. For the Chickasaw Visitor Center the New Year was a milestone that signaled we were moving forward into another year of progress on the project. The first new year’s milestone in 2012 signaled the transition from schematic design (preliminary design) to design development (final design). The second New Year’s milestone in 2013 signaled construction was well on its way. 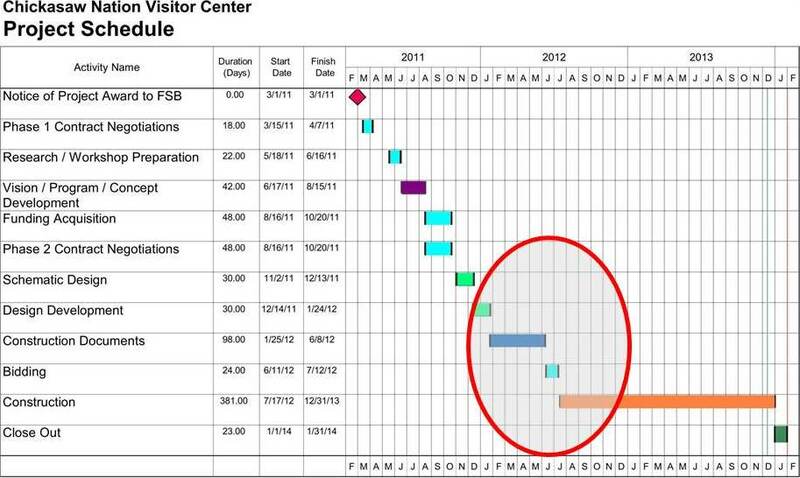 Here are the activities that launched the Visitor Project into 2012 beginning with Design Development then moving Construction Documents and Construction and concludes with the Visitor Center crossing over into 2013. January 4; Revit model being updated to version 2012. January 5; Design Development (DD) phase Quality Control (QC) check sets being plotted for the QC Team which is an independent team of FSB architects and engineers from the design/production team. January 5; gathering and comparing various manufacturers wood ceiling systems. January 8; gathering manufacturer information on mechanical split systems for heating and cooling. January 9; Design and QC teams meet to discuss review comments on DD documents. January 9; FSB receives the final subsurface investigation report from the Geotechnical Consultant which provides the information needed to design the foundations, slabs on grade and paving. January 11; architectural and engineering systems descriptions are being updated for incorporation into the DD submission book. January 12; updated interior and exterior renderings are being finalized for the DD submission book. 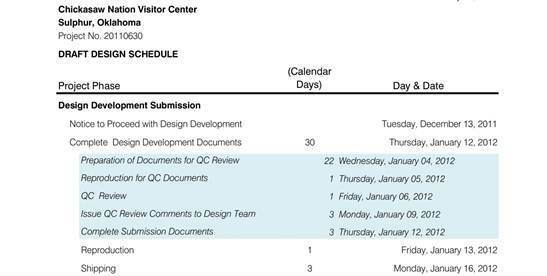 January 14; receive confirmation from the U.S. Green Building Council (USGBC) that the Visitor Center has been successfully registered and FSB can begin to manage the project and begin the application process of sustainable design. January 16; FSB team members are entered as Project Team Managers in their respective discipline roles for access to the project LEED site. January 20; updated Project Schedule for AE services is ready for inclusion in the DD submission book. This detailed schedule keeps the team members focused on milestones and deliverables and communicates to the Client the project schedule. January 25; DD Submission Document meeting with the Chickasaw Nation (Client) to review the DD Submission document. January 26; FSB kicks-off Construction Documents Phase of the project. The Construction Documents are a combination of the drawings and specifications that the contractor will use to both price and build the project. February 19; Owner review comments for DD Submission are distributed to the FSB team. February 21; FSB team is reviewing LEED points that we can obtain for the project certification. February 27; updated Issues/Action list distributed to keep everyone focused on open topics and who’s responsible to get information to resolve them. February 27; FSB Team meeting to review progress. March 1; 50% Quality Control sets distributed to FSB Peer Review Team. March 8; 50% Submission of Construction Documents to the Client. March 27; 50% review meeting with the Client. March/April; continued finalization of selection of systems and components, coordination and integration of architectural and engineering systems and development of construction details. April 4; FSB provides a list of potential Construction Manager contractors to the Client. April 27; CM’s are directed to FSB Blog site to get background information on the Visitor Center. May 4; conference call to discuss CM selection. June 5; meeting with selected CM contractor, Flintco, to begin the bidding of the project by subcontractors. July 16; meeting to discuss the Guaranteed Maximum Price with Contractor and Client. July 25; reviewing Value Engineering cost reduction items with the Client. September 24; first set of submittals received from Contractor. October/November/December; ongoing communication with the Contractor; RFI’s, Clarifications, Addenda, Supplemental Documents, Product Submittals, Construction Observations, Bi-weekly Construction Site Meetings. Construction is moving forward. December 21; Field Report 1. Construction Progress; The current work in progress: Concrete work on the building is 75% complete. The underground installation of conduit and plumbing is 90% complete. Back filling against the north side is 50% complete. Waterproofing around the vertical walls is 75% complete. Utility installation across Davis Street is complete. Lower perimeter drain installation is complete.